A renaissance is going on within the geek culture. What was once held sacred by an eclectic few is now being embraced by everyone. Many people today are only affiliated with the superhero of their particular era. For some, Christopher Reeve is Superman. Others have fond memories of Adam West and Burt Ward as the Dynamic Duo. Yet, today, superheroes run rampant on TV and in movies making Grant Gustin The Flash and Ben Affleck, Batman. How does one share the superheroes of yesteryear and still embrace the modern gods that now populate our everyday life? This is why The Music Of DC Comics: Volume 2 arrives at the perfect time. I have flown my geek flag my whole life. John Williams’ classic score for Superman wasn’t always classic to me. It was new, fantastic, and made me believe that I too could fly (there are two tracks here from that score, tracks #5 and #15). However, as I learned more about Superman and the heroes that filled the Hall of Justice, I discovered there was even more music to the DC Comics Universe. It all begins with Bud Collyer’s Superman Radio Show (track #1). This track sets the mood and fills the listener in on just who this being from another world is. Fear not, if you do not know who Batman is, Batman and Robin: Batman Takes Over supplies a great intro clip to the 1949 serial. These are fun and great reminders of what has came before. Yet it surprised me how easily they blended with the more modern music. For the more modern fan, Warner Brothers has suppled tracks from Man of Steel (track #2), Batman v Superman (track #6), and The Dark Knight Rises (track #11). In short, you have more than enough Hans Zimmer if you don’t already possess one of these now classic movie scores. Today, DC’s heroes are on the small screen as well, making Blake Neely the Hans Zimmer of the small screen. If you don’t already know, Neely composes the music for The Flash, Arrow, Legends of Tomorrow, and Supergirl. All of these have either themes or mash ups present on this album. Neely captures the feel of a big movie score and thus elevates the adventures of these characters on the small screen. What about Gotham? “Penguin Makes Moves” (track #16) paints a perfect twisted portrait of Gotham, where villains reign and Batman is not yet on the scene. The Music Of DC Comics: Volume 2 has a few additional rare gems that, unless you are a die-hard, you have may have only heard once during your childhood. To start, there are several tracks from the Batman 66 TV series. The most obvious is the classic theme by Neil Hefti (track #7). There is also “Penguin’s Umbrella” (track # 17) and “Joker Is Wild” (track #13), both by The Sensational Guitars of Dan and Dale: Sun Ra and The Blues Project, which supply the perfect swinging attitude that West, Ward, Romero, and Meredith brought to their characters. If only Warner Brothers would release a larger compilation of the 1966 Batman music. These samplings provide just enough of a taste to want more. There are more than enough cartoon tracks here to make any child of the 80’s and 90’s (who are now the parents) bounce with glee. Danny Elfman’s classic opening titles to the Batman: Animated Series (track #8) is here. Shirley Walker’s Superman: The Animated Series theme is also present with its uplifting overture. However, Walker really shined while supplying all the music to the actual Batman: The Animated Series. Relish in the holiday track “Christmas With The Joker / Jingle Bells Batman Smells”, which is complete with the Joker, himself (Mark Hamill). There is a ton of great stuff on this album. You’ll remember Superman and Lois’s first flight. Imagine that you are running faster than you ever thought possible in the theme to the 90’s The Flash (track #26). And before you know it, you’ll be humming “Metamorpho” (track #24) and wondering why you never heard it before. This is a great collection and perfect for the geek family on a road trip to Comic Con or just out to see the next superhero film. 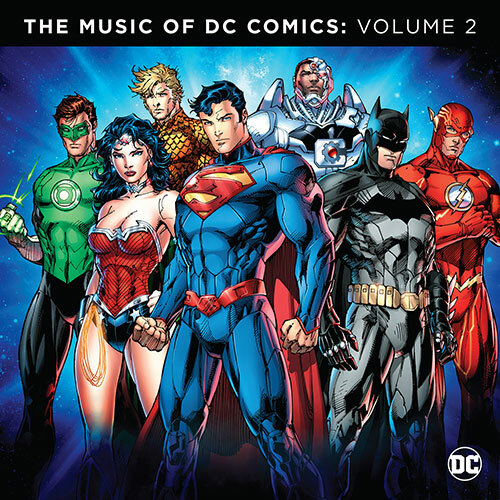 Order The Music Of DC Comics: Volume 2 here at Water-Tower Music. Check out the Sci-Fi Movie Page’s review of Hans Zimmer and Junkie XL’s Batman v Superman: Dawn of Justice score here. Check out the Sci-Fi Movie Page’s review of The Flash and Arrow soundtracks here. This is a great collection and perfect for the geek family on a road trip to Comic Con or just out to see the next superhero film.